Clin Cancer Res 2013 19(11), 2984-94. BMS-754807 purchased from Selleck. Muti-inhibitor of the IGR-1R/IR family. The primary screen for BMS-754807 is an in vitro kinase assay using recombinant human IGF-1 receptor enzyme in biochemical assays using synthetic peptide KKSRGDYMTMQIG as a phosphoacceptor substrate. The selectivity profile is evaluated against multiple recombinant enzymes that are generated at BMS or purchased externally. The enzymatic assays are performed in Ubottom 384-well plates using a 30 μL reaction volume in assay buffer (100 mM Hepes pH 7.4, 10 mM MgCl2, 0.015% Brij35 and 4 mM DTT). The 60 minute reactions are initiated by combining ATP (concentration equivalent to Km ATP), 1.5 μM fluoresceinlabeled peptide substrate, enzyme and BMS-754807. The reactions are terminated with EDTA. The reaction mixtures are analyzed on the Caliper LabChip 3000 by electrophoretic separation of the fluorescent substrate and phosphorylated product. 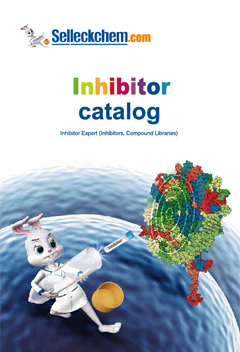 Inhibition data are calculated by comparison to enzyme-free control reactions for 100% inhibition and vehicle-only reactions for 0% inhibition. Compounds are dissolved in dimethylsulfoxide (DMSO, 10mM stock) and evaluated at eleven concentrations. IC50 values are derived by non-linear regression analysis of the dose response curves. Method: Cells are grown at their optimal density in RPMI +GlutaMax supplemented with 10% heat-inactivated fetal bovine serum (FBS), 10 mM Hepes, penicillin, and streptomycin. Cell proliferation is evaluated by incorporation of 3H-thymidine into DNA after exposure of cells to BMS-754807 for 72 hours. Results are expressed as an IC50, which is the drug concentration required to inhibit cell proliferation by 50% compared with untreated control cells. Carboni JM, et al. Mol Cancer Ther, 2009, 8(12), 3341-3349. Wittman MD, et al. J Med Chem, 2009, 52(23), 7360-7363. Kolb EA, et al. Pediatr Blood Cancer, 2011, 56(4), 595-603. NVP-AEW541 : IGF-1R-selective, IC50=86 nM. 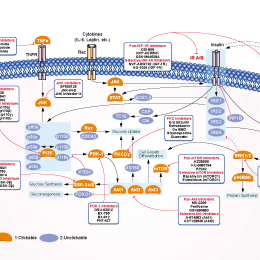 OSI-906 (Linsitinib) : Phase II for Advanced Solid Tumors. PQ 401 : Inhibitor of autophosphorylation of IGF-1R domain with IC50 of <1 μM. BMS-536924 : ATP-competitive IGF-1R/IR inhibitor with IC50 of 100 nM/73 nM, modest activity for Mek, Fak, and Lck with very little activity for Akt1, MAPK1/2.